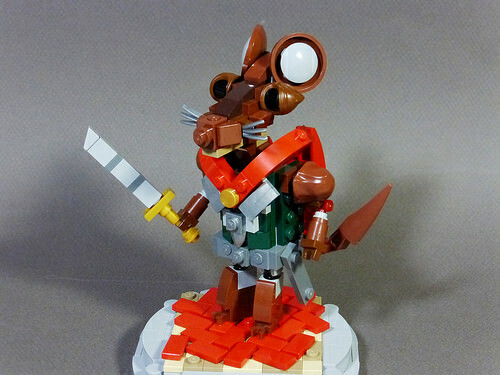 I grew up reading the Redwall series, and despite the fact that the books didn’t vary much in plot (usually something to do with defending the Abbey, or rescuing the youngsters from some nefarious evildoers) the books still hold a special, nostalgia-tinged place in my heart. Stormbringer takes a break from his series of dragons to post this much fluffier model of Martin, the hero of the very first book of the series. Hate to be that guy, and in my defense I’ve not read the books in years, but… Martin wasn’t the hero in most of the books. Matthias was. Martin was the legendary hero that inspired Matthias, and the hero of several prequels in the series. Maybe he means first chronologically within the in-book universe rather than publishing history. (The same debate is made frequently with the Narnia series.) Although Jacques may have written books that prequel Martin by now, too. Ironically, I haven’t kept up with the series since I had kids.